Myanmar's worst floods for decades have killed at least 13 people and affected more than 360,000 people. The Myanmar Red Cross Society, with Federation support, has launched a relief operation that will immediately assist 55,000 of the most vulnerable by providing basic relief supplies and will later help 1,000 families rebuild their homes. The UN Resident Coordinator in Yangon informs that the UN Disaster Management Team (UNDMT) has returned from a field mission to the Mon State to assess the impact of the recent floods and to identify priority needs for the affected population in the area. later help 1,000 families rebuild their homes. with rice, oil, mosquito nets, blankets, and sarongs. The Australian Government today announced a contribution of $50 000 in emergency assistance to help cope with recent monsoonal flooding in Burma. The flooding has caused widespread loss of life and displaced thousands of people from their homes. Heavier than usual monsoon rains have led to flooding throughout Burma causing the deaths of up to 100 people and extensive damage to houses, livestock and agricultural equipment. 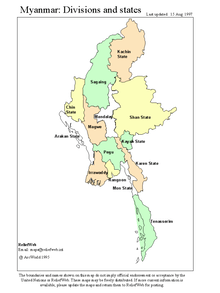 Chindwin, Ayeyarwaddy, Sittaung and Thanlwin (Salween) rivers. hundreds of thousands of people from their homes. As Myanmar is formally admitted to the Association of Southeast Asian Nations (ASEAN), it shows no sign of improving its human rights performance, despite hopes placed on the policy of constructive engagement by its regional partners. At the end of May 1997 ASEAN announced that Myanmar, Laos, and Cambodia would be admitted as full members at their late July ministerial meeting in Kuala Lumpur, Malaysia. 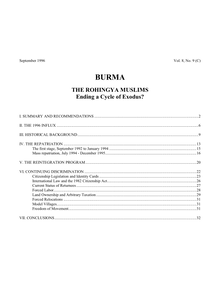 The title of this report is taken from a United Nations High Commissioner for Refugees (UNHCR) report of June 1995 on the repatriation of over 200,000 Burmese refugees, most of them members of the Rohingya Muslim minority, from Bangladesh to their home state of Arakan in northern Burma. The repatriation is being held up as a success story by the UNHCR.